Each aircraft handles somewhat differently because each resists or responds to control pressures in its own way. For example, a training aircraft is quick to respond to control applications, while a transport aircraft feels heavy on the controls and responds to control pressures more slowly. These features can be designed into an aircraft to facilitate the particular purpose of the aircraft by considering certain stability and maneuvering requirements. 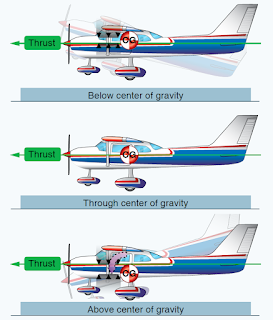 The following discussion summarizes the more important aspects of an aircraft’s stability, maneuverability, and controllability qualities; how they are analyzed; and their relationship to various flight conditions. Stability is the inherent quality of an aircraft to correct for conditions that may disturb its equilibrium and to return to or to continue on the original flight path. It is primarily an aircraft design characteristic. The flight paths and attitudes an aircraft flies are limited by the aerodynamic characteristics of the aircraft, its propulsion system, and its structural strength. 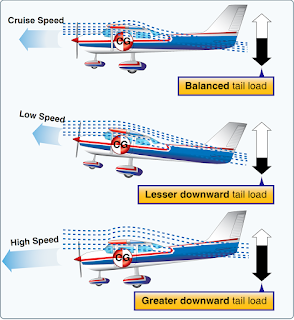 These limitations indicate the maximum performance and maneuverability of the aircraft. If the aircraft is to provide maximum utility, it must be safely controllable to the full extent of these limits without exceeding the pilot’s strength or requiring exceptional flying ability. If an aircraft is to fly straight and steady along any arbitrary flight path, the forces acting on it must be in static equilibrium. The reaction of any body when its equilibrium is disturbed is referred to as stability. The two types of stability are static and dynamic. Static stability refers to the initial tendency, or direction of movement, back to equilibrium. In aviation, it refers to the aircraft’s initial response when disturbed from a given pitch, yaw, or bank. Figure 2. Damped versus undamped stability. Positive dynamic stability—over time, the motion of the displaced object decreases in amplitude and, because it is positive, the object displaced returns toward the equilibrium state. Neutral dynamic stability—once displaced, the displaced object neither decreases nor increases in amplitude. A worn automobile shock absorber exhibits this tendency. Negative dynamic stability—over time, the motion of the displaced object increases and becomes more divergent. Maneuverability—the quality of an aircraft that permits it to be maneuvered easily and to withstand the stresses imposed by maneuvers. It is governed by the aircraft’s weight, inertia, size and location of flight controls, structural strength, and powerplant. It too is an aircraft design characteristic. Controllability—the capability of an aircraft to respond to the pilot’s control, especially with regard to flight path and attitude. It is the quality of the aircraft’s response to the pilot’s control application when maneuvering the aircraft, regardless of its stability characteristics. In designing an aircraft, a great deal of effort is spent in developing the desired degree of stability around all three axes. But longitudinal stability about the lateral axis is considered to be the most affected by certain variables in various flight conditions. Longitudinal stability is the quality that makes an aircraft stable about its lateral axis. It involves the pitching motion as the aircraft’s nose moves up and down in flight. A longitudinally unstable aircraft has a tendency to dive or climb progressively into a very steep dive or climb, or even a stall. Thus, an aircraft with longitudinal instability becomes difficult and sometimes dangerous to fly. In analyzing stability, it should be recalled that a body free to rotate always turns about its CG. To obtain static longitudinal stability, the relation of the wing and tail moments must be such that, if the moments are initially balanced and the aircraft is suddenly nose up, the wing moments and tail moments change so that the sum of their forces provides an unbalanced but restoring moment which, in turn, brings the nose down again. Similarly, if the aircraft is nose down, the resulting change in moments brings the nose back up. Figure 3 shows an aircraft in straight-and-level flight. 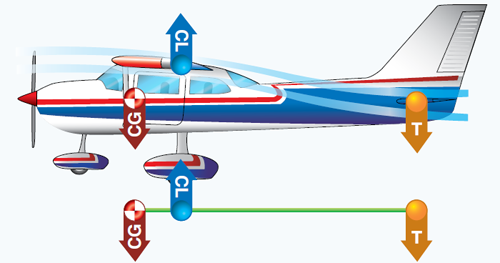 The line CG-CL-T represents the aircraft’s longitudinal axis from the CG to a point T on the horizontal stabilizer. Most aircraft are designed so that the wing’s CL is to the rear of the CG. This makes the aircraft “nose heavy” and requires that there be a slight downward force on the horizontal stabilizer in order to balance the aircraft and keep the nose from continually pitching downward. Compensation for this nose heaviness is provided by setting the horizontal stabilizer at a slight negative AOA. The downward force thus produced holds the tail down, counterbalancing the “heavy” nose. It is as if the line CG-CL-T were a lever with an upward force at CL and two downward forces balancing each other, one a strong force at the CG point and the other, a much lesser force, at point T (downward air pressure on the stabilizer). To better visualize this physics principle: If an iron bar were suspended at point CL, with a heavy weight hanging on it at the CG, it would take downward pressure at point T to keep the “lever” in balance. Even though the horizontal stabilizer may be level when the aircraft is in level flight, there is a downwash of air from the wings. 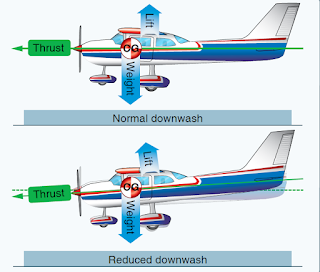 This downwash strikes the top of the stabilizer and produces a downward pressure, which at a certain speed is just enough to balance the “lever.” The faster the aircraft is flying, the greater this downwash and the greater the downward force on the horizontal stabilizer (except T-tails). 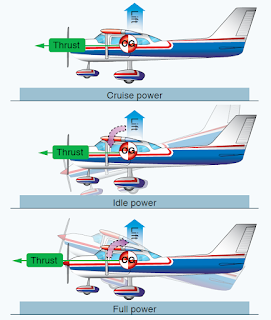 [Figure 4] In aircraft with fixed-position horizontal stabilizers, the aircraft manufacturer sets the stabilizer at an angle that provides the best stability (or balance) during flight at the design cruising speed and power setting. If the aircraft’s speed decreases, the speed of the airflow over the wing is decreased. As a result of this decreased flow of air over the wing, the downwash is reduced, causing a lesser downward force on the horizontal stabilizer. In turn, the characteristic nose heaviness is accentuated, causing the aircraft’s nose to pitch down more. [Figure 5] This places the aircraft in a nose-low attitude, lessening the wing’s AOA and drag and allowing the airspeed to increase. As the aircraft continues in the nose-low attitude and its speed increases, the downward force on the horizontal stabilizer is once again increased. Consequently, the tail is again pushed downward and the nose rises into a climbing attitude. As this climb continues, the airspeed again decreases, causing the downward force on the tail to decrease until the nose lowers once more. Because the aircraft is dynamically stable, the nose does not lower as far this time as it did before. The aircraft acquires enough speed in this more gradual dive to start it into another climb, but the climb is not as steep as the preceding one. After several of these diminishing oscillations, in which the nose alternately rises and lowers, the aircraft finally settles down to a speed at which the downward force on the tail exactly counteracts the tendency of the aircraft to dive. When this condition is attained, the aircraft is once again in balanced flight and continues in stabilized flight as long as this attitude and airspeed are not changed. A similar effect is noted upon closing the throttle. The downwash of the wings is reduced and the force at T in Figure 3 is not enough to hold the horizontal stabilizer down. It seems as if the force at T on the lever were allowing the force of gravity to pull the nose down. This is a desirable characteristic because the aircraft is inherently trying to regain airspeed and reestablish the proper balance. Power or thrust can also have a destabilizing effect in that an increase of power may tend to make the nose rise. The aircraft designer can offset this by establishing a “high thrust line” wherein the line of thrust passes above the CG. [Figures 6 and 7] In this case, as power or thrust is increased a moment is produced to counteract the down load on the tail. On the other hand, a very “low thrust line” would tend to add to the nose-up effect of the horizontal tail surface. 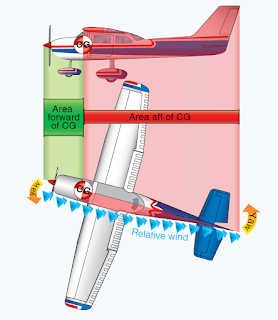 Conclusion: with CG forward of the CL and with an aerodynamic tail-down force, the aircraft usually tries to return to a safe flying attitude. The following is a simple demonstration of longitudinal stability. Trim the aircraft for “hands off” control in level flight. Then, momentarily give the controls a slight push to nose the aircraft down. If, within a brief period, the nose rises towards the original position, the aircraft is statically stable. Ordinarily, the nose passes the original position (that of level flight) and a series of slow pitching oscillations follows. If the oscillations gradually cease, the aircraft has positive stability; if they continue unevenly, the aircraft has neutral stability; if they increase, the aircraft is unstable. Stability about the aircraft’s longitudinal axis, which extends from the nose of the aircraft to its tail, is called lateral stability. 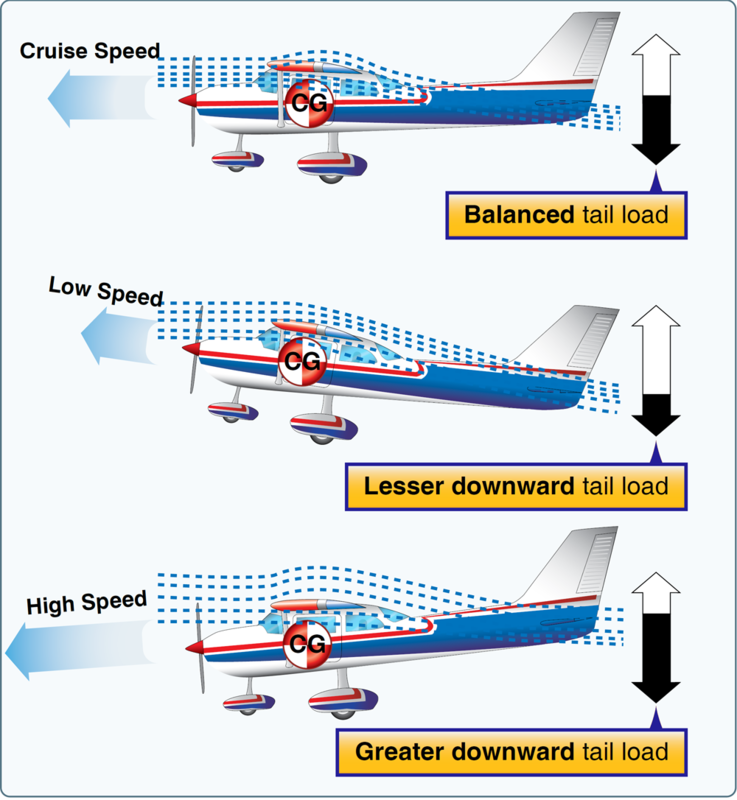 Positive lateral stability helps to stabilize the lateral or “rolling effect” when one wing gets lower than the wing on the opposite side of the aircraft. There are four main design factors that make an aircraft laterally stable: dihedral, sweepback, keel effect, and weight distribution. 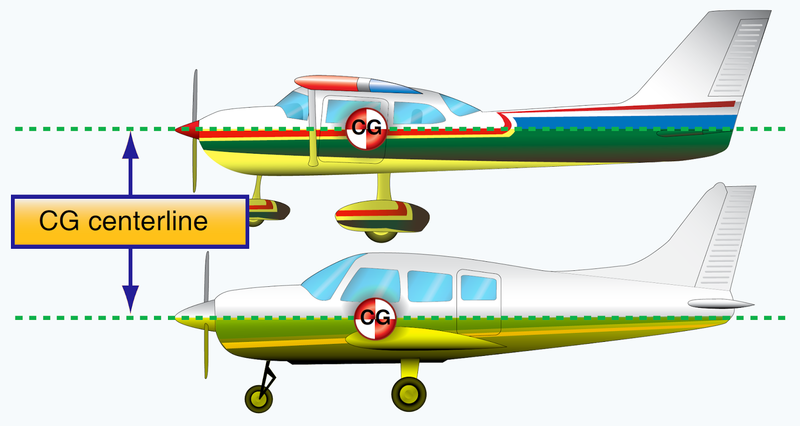 Many aspects of an aircraft's configuration can affect its effective dihedral, but two major components are wing sweepback and the wing location with respect to the fuselage (such as a low wing or high wing). As a rough estimation, 10° of sweepback on a wing provides about 1° of effective dihedral, while a high wing configuration can provide about 5° of effective dihedral over a low wing configuration. A sweptback wing is one in which the leading edge slopes backward. [Figure 10] When a disturbance causes an aircraft with sweepback to slip or drop a wing, the low wing presents its leading edge at an angle that is more perpendicular to the relative airflow. 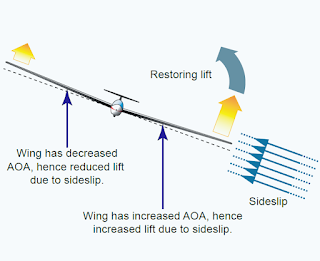 As a result, the low wing acquires more lift, rises, and the aircraft is restored to its original flight attitude. A high wing aircraft always has the tendency to turn the longitudinal axis of the aircraft into the relative wind, which is often referred to as the keel effect. 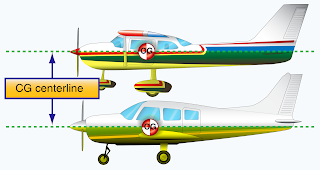 These aircraft are laterally stable simply because the wings are attached in a high position on the fuselage, making the fuselage behave like a keel exerting a steadying influence on the aircraft laterally about the longitudinal axis. When a high-winged aircraft is disturbed and one wing dips, the fuselage weight acts like a pendulum returning the aircraft to the horizontal level. Laterally stable aircraft are constructed so that the greater portion of the keel area is above the CG. 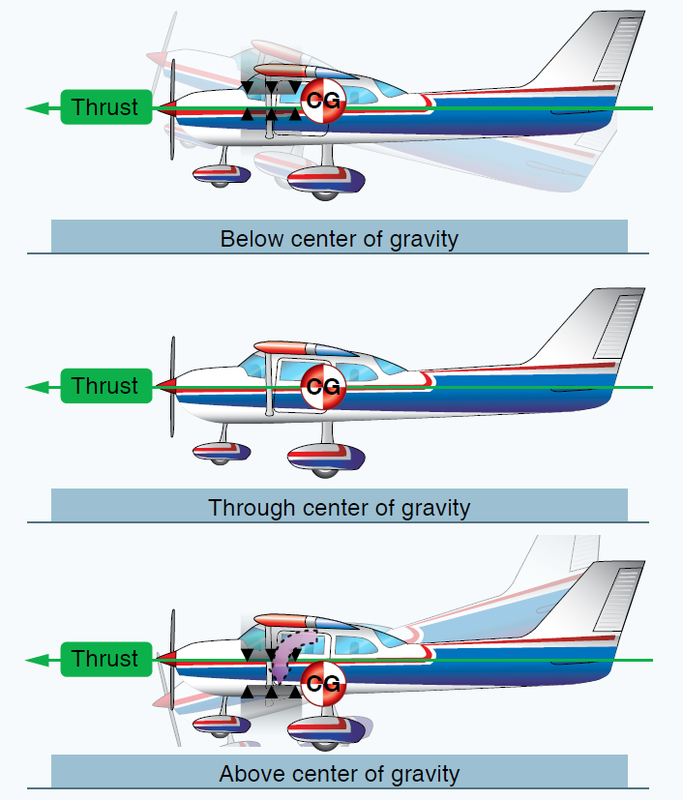 [Figure 11] Thus, when the aircraft slips to one side, the combination of the aircraft’s weight and the pressure of the airflow against the upper portion of the keel area (both acting about the CG) tends to roll the aircraft back to wings-level flight. 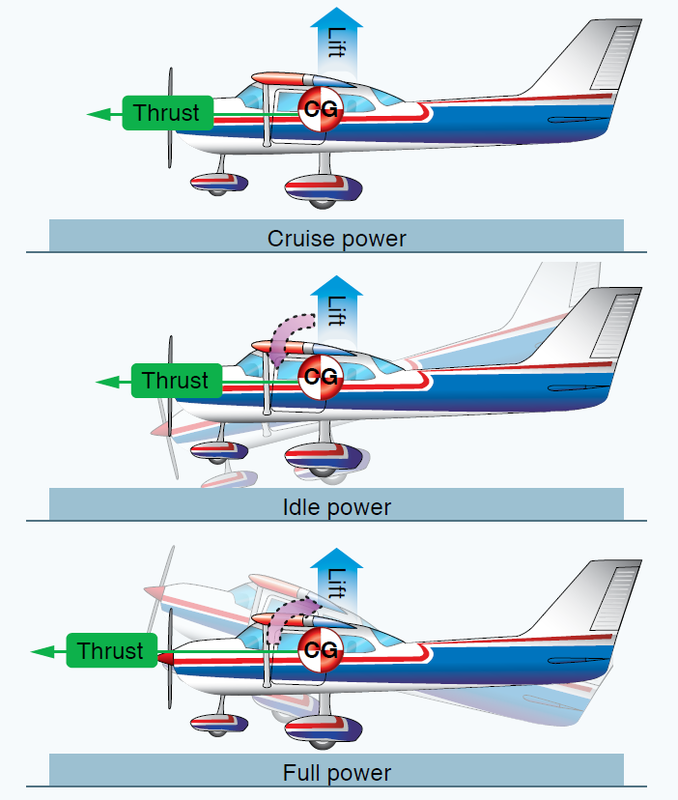 Stability about the aircraft’s vertical axis (the sideways moment) is called yawing or directional stability. Yawing or directional stability is the most easily achieved stability in aircraft design. The area of the vertical fin and the sides of the fuselage aft of the CG are the prime contributors that make the aircraft act like the well known weather vane or arrow, pointing its nose into the relative wind. In examining a weather vane, it can be seen that if exactly the same amount of surface were exposed to the wind in front of the pivot point as behind it, the forces fore and aft would be in balance and little or no directional movement would result. Consequently, it is necessary to have a greater surface aft of the pivot point than forward of it. Similarly, the aircraft designer must ensure positive directional stability by making the side surface greater aft than ahead of the CG. 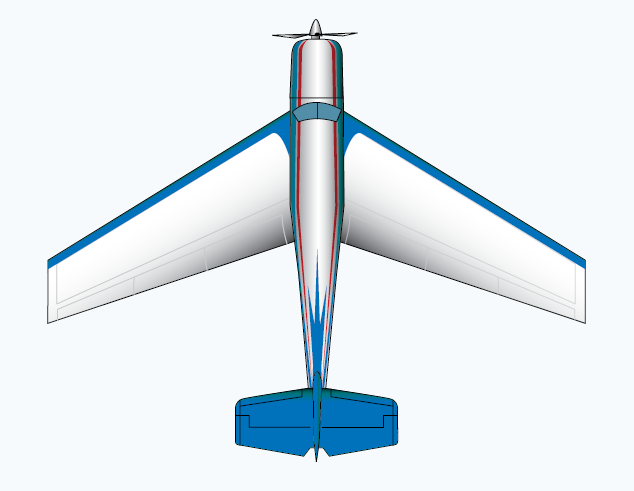 [Figure 12] To provide additional positive stability to that provided by the fuselage, a vertical fin is added. The fin acts similar to the feather on an arrow in maintaining straight flight. Like the weather vane and the arrow, the farther aft this fin is placed and the larger its size, the greater the aircraft’s directional stability. If an aircraft is flying in a straight line, and a sideward gust of air gives the aircraft a slight rotation about its vertical axis (i.e., the right), the motion is retarded and stopped by the fin because while the aircraft is rotating to the right, the air is striking the left side of the fin at an angle. This causes pressure on the left side of the fin, which resists the turning motion and slows down the aircraft’s yaw. In doing so, it acts somewhat like the weather vane by turning the aircraft into the relative wind. The initial change in direction of the aircraft’s flight path is generally slightly behind its change of heading. Therefore, after a slight yawing of the aircraft to the right, there is a brief moment when the aircraft is still moving along its original path, but its longitudinal axis is pointed slightly to the right. The aircraft is then momentarily skidding sideways and, during that moment (since it is assumed that although the yawing motion has stopped, the excess pressure on the left side of the fin still persists), there is necessarily a tendency for the aircraft to be turned partially back to the left. That is, there is a momentary restoring tendency caused by the fin. This restoring tendency is relatively slow in developing and ceases when the aircraft stops skidding. When it ceases, the aircraft is flying in a direction slightly different from the original direction. In other words, it will not return of its own accord to the original heading; the pilot must reestablish the initial heading. A minor improvement of directional stability may be obtained through sweepback. Sweepback is incorporated in the design of the wing primarily to delay the onset of compressibility during high-speed flight. In lighter and slower aircraft, sweepback aids in locating the center of pressure in the correct relationship with the CG. A longitudinally stable aircraft is built with the center of pressure aft of the CG. Because of structural reasons, aircraft designers sometimes cannot attach the wings to the fuselage at the exact desired point. If they had to mount the wings too far forward, and at right angles to the fuselage, the center of pressure would not be far enough to the rear to result in the desired amount of longitudinal stability. By building sweepback into the wings, however, the designers can move the center of pressure toward the rear. The amount of sweepback and the position of the wings then place the center of pressure in the correct location. When turbulence or rudder application causes the aircraft to yaw to one side, the opposite wing presents a longer leading edge perpendicular to the relative airflow. The airspeed of the forward wing increases and it acquires more drag than the back wing. The additional drag on the forward wing pulls the wing back, turning the aircraft back to its original path. The contribution of the wing to static directional stability is usually small. The swept wing provides a stable contribution depending on the amount of sweepback, but the contribution is relatively small when compared with other components. Dutch roll is a coupled lateral/directional oscillation that is usually dynamically stable but is unsafe in an aircraft because of the oscillatory nature. The damping of the oscillatory mode may be weak or strong depending on the properties of the particular aircraft. If the aircraft has a right wing pushed down, the positive sideslip angle corrects the wing laterally before the nose is realigned with the relative wind. As the wing corrects the position, a lateral directional oscillation can occur resulting in the nose of the aircraft making a figure eight on the horizon as a result of two oscillations (roll and yaw), which, although of about the same magnitude, are out of phase with each other. In most modern aircraft, except high-speed swept wing designs, these free directional oscillations usually die out automatically in very few cycles unless the air continues to be gusty or turbulent. Those aircraft with continuing Dutch roll tendencies are usually equipped with gyro-stabilized yaw dampers. Manufacturers try to reach a midpoint between too much and too little directional stability. Because it is more desirable for the aircraft to have “spiral instability” than Dutch roll tendencies, most aircraft are designed with that characteristic. Spiral instability exists when the static directional stability of the aircraft is very strong as compared to the effect of its dihedral in maintaining lateral equilibrium. When the lateral equilibrium of the aircraft is disturbed by a gust of air and a sideslip is introduced, the strong directional stability tends to yaw the nose into the resultant relative wind while the comparatively weak dihedral lags in restoring the lateral balance. Due to this yaw, the wing on the outside of the turning moment travels forward faster than the inside wing and, as a consequence, its lift becomes greater. This produces an overbanking tendency which, if not corrected by the pilot, results in the bank angle becoming steeper and steeper. At the same time, the strong directional stability that yaws the aircraft into the relative wind is actually forcing the nose to a lower pitch attitude. A slow downward spiral begins which, if not counteracted by the pilot, gradually increases into a steep spiral dive. Usually the rate of divergence in the spiral motion is so gradual the pilot can control the tendency without any difficulty. Many aircraft are affected to some degree by this characteristic, although they may be inherently stable in all other normal parameters. This tendency explains why an aircraft cannot be flown “hands off” indefinitely. Much research has gone into the development of control devices (wing leveler) to correct or eliminate this instability. The pilot must be careful in application of recovery controls during advanced stages of this spiral condition or excessive loads may be imposed on the structure. Improper recovery from spiral instability leading to inflight structural failures has probably contributed to more fatalities in general aviation aircraft than any other factor. Since the airspeed in the spiral condition builds up rapidly, the application of back elevator force to reduce this speed and to pull the nose up only “tightens the turn,” increasing the load factor. The results of the prolonged uncontrolled spiral are inflight structural failure, crashing into the ground, or both. Common recorded causes for pilots who get into this situation are loss of horizon reference, inability to control the aircraft by reference to instruments, or a combination of both.